Since we had been on the road for the last few days, and my parents were recovering from being ill, we had a very, very quiet Easter. I had cooked everything the night before with the exception of the ham, and we were happy just to enjoy a nice meal together. The bunny was especially good to little man, bring him a new, 24″ bike with his basket. He has had quite the growth spurt in the last few months and was in desperate need. He is definitely going to need to get used to the hand brakes and gears, but he is so much more comfortable! I think we were all just excited to get back to our regular schedule. With all the craziness and travel, I can’t even remember the last time we did a full grocery shop. Fortunately, we had plenty of leftovers to carry us through the week. I was able to meet up with S for four miles and then ran one more when I got home. It felt pretty good, and it’s nice to be back running with a buddy. Mr PugRunner had to leave town for a conference on Thursday, so I met S for a second run. I hate going back to back and this one was definitely tough. I had the day off work, and spent it finally cleaning and getting to the store. We had tons of laundry and organizing to get down, an edit was the perfect opportunity to do it. That evening, little man had his Blue & Gold Ceremony or Cub Scouts. He earned some more patches and badges and moved up to Webelo. There was a celebratory dinner and lots of nice speeches. I was so proud of him, and he’s very excited for next year. Friday was incredibly unproductive. I picked up my packet for Ultimate Tri on Sunday, and then sat myself down on the couch and didn’t move. Mr PugRunner came home that evening, and we were all just happy to spend some time together. He LOVES hunting for treasure and has been intrigued by people using these on the sand, so now he can join right in the fun! and then I spent the rest of the afternoon prepping for Sunday’s Ultimate Tri. I had to pack, eat, and get myself to bed for a good night’s sleep. Eek! So, there was a lot going on, but at the same time, not much. I assure you, the next few weeks are going to be a frenetic whirlwind. I have a few 5Ks coming up in May, but nothing more ambitious than that on the running front. I do plan, however, on upping the mileage on the bike. Mr PugRunner wants to join me, so we are in the market for a bike rack so the whole family can partake. Is there a workout or activity your whole family enjoys? Great week for you Jenn! I love the flat you for the tri- that is super exciting! It is nice when the family can all do something together. We have golf and then some fun on the water is always nice too- even though I don’t care for skiing. I am in the boat- close enough! Mary Beth Jackson recently posted…My April progress and a FULL fall schedule! Wow! A Tri. I can’t imagine. Good for you. Ah! I can’t wait to read all about the tri! Sounds like another great week, with plenty of family time in there! 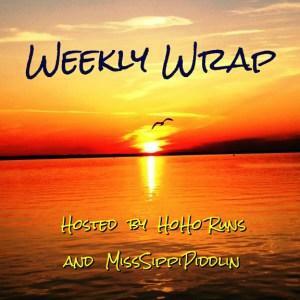 Stacie recently posted…What’s up Wednesday!